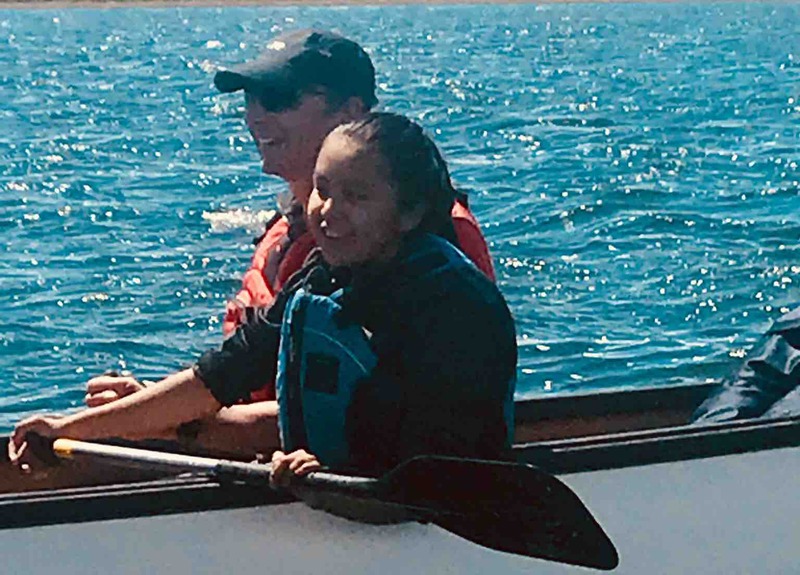 The Ocean Spirit Canoe Family was formed by Max Henry of the Pauquachin First Nation and Pamela Falconer of the Heiltsuk First Nation as a means of instilling strong healthy family values in high risk First Nations Youth. We believe that by doing so our youth will pass these values on to the families they live with now as well as the families they will create in the future. This is our fourth year together as a Canoe Family and IT IS WORKING! Our Canoe Family meets weekly during the spring and summer to ready ourselves for Pulling Together 2018. The Pulling Together Canoe Journeys are organized annually by the Pulling Together Canoe Society. The purpose of the Pulling Together Canoe Society (PTCS)is to bring together First Nations and their youth, police and other government agencies in a setting that will foster trust and build relationships. Information regarding the PTCS and this year's journey can be found on the pullingtogether.ca website. The Ocean Spirit Canoe Family is reaching out to you because we want to send our youth on this Canoe Journey. We finally started a GoFundMe to get us there as this will be a journey of a lifetime for our youth. This year's journey is a ten day paddling and camping adventure from Vancouver Island to the mainland. Our youth will start their paddle in the Esquimalt First Nation, through the Salish Seas, they will navigate Boundary Pass and cross the magnificent Georgia Straight to end their journey at HMCS Discovery. OUR YOUTH WANT TO BE A PART OF THIS! In order to do this unique paddling adventure our group needs to raise $8300.00. The cost of individual registration for 20 participants($175.00)and canoe registration ($500.00) alone is $4,000.00, and this is where we need your help. To date, our group has raised just over $2000.00 and we are working hard with loonie toonie auctions, hot dog sales and car washes to pay for our food, gas, ferry transportation and registrations costs to get there. Please help by supporting our Canoe Family and sending 15 youth and 5 chaperones to Pulling Together 2018 by making a donation and share it with your social network. WE WOULD GREATLY APPRECIATE IT! We know money can be tight, so please know that even $5.00 helps get our youth on a ten day Canoe Journey for a lifetime of happy memories. Should you have any questions please ask and I will answer them. Thanks once again for the generous donations. We have been practicing Saturdays at the Esquimalt Lagoon. Our youth are coming along wonderfully. It amazes me to no end how paddling is in their blood!!! Still working hard at raising funds. For those that can make it we will be taking part in the First Indigenous Peoples Day, June 21st, at the Esquimalt Lagoon. Event starts at 9 a.m. and ends at 4 p.m. Thank you to our supporters that have taken the time to share our campaign. By sharing we will make our goal of $3500.00 and get our youth to Pulling Together 2018. Even a donation of $5.00 helps pay for the individual registration of a youth to this wonderful Canoe Journey! Thank you Keil for your donation and hands up to you for organizing the canoe event on National Indigenous Peoples Day (June 21st) at the Esquimalt Lagoon. The Ocean Spirit Canoe Family looks forward to paddling with you.